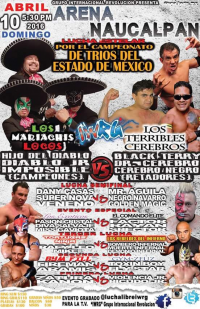 Demonio & Muerte are Bombero's sons. Mike replaced Zatura. torneo FILL, FILL vs Zeus, but it's the loser who loses hair or mask. Galaxy replaced Rower Boy, Atomic Fly, Marduk & Keshin Black were replaced by Madision Kid (so it was 8 on 6?) Aramis took replacement Madison Kid's hair. 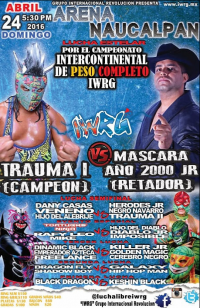 1) Kanon & Zatura b Picudo Jr. & Violencia Jr.
rudos pulled Rafy's mask for the DQ. 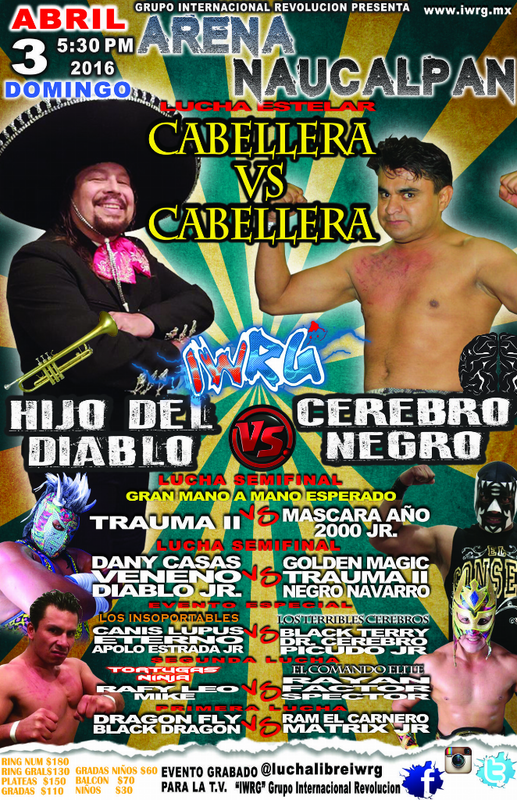 Golden Magic is indeed now a rudo, with an evil mask. Third fall went to a double pin (or maybe double submission). This week (and not last week), the commission allowed one more fall. Mariachis Locos took it for the win. First defense, rematch against ex-champions. 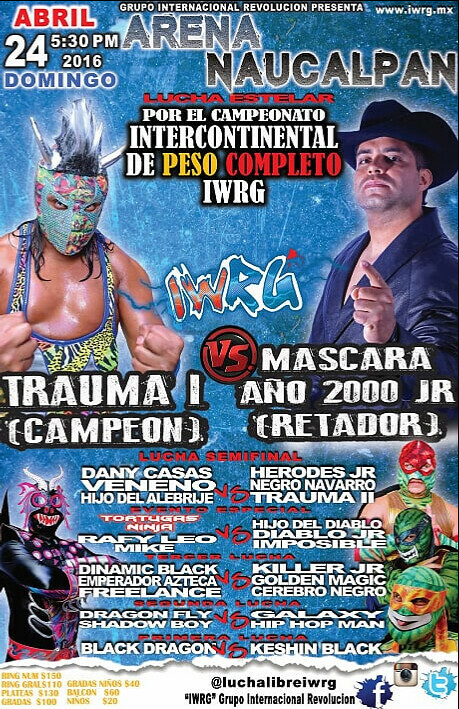 1) Black Dragón & Guerrero 2000 b Galaxy & Matrix Jr.
Adrenalina kept screwing up, and Freyser turned on him. Straight falls. Good match. 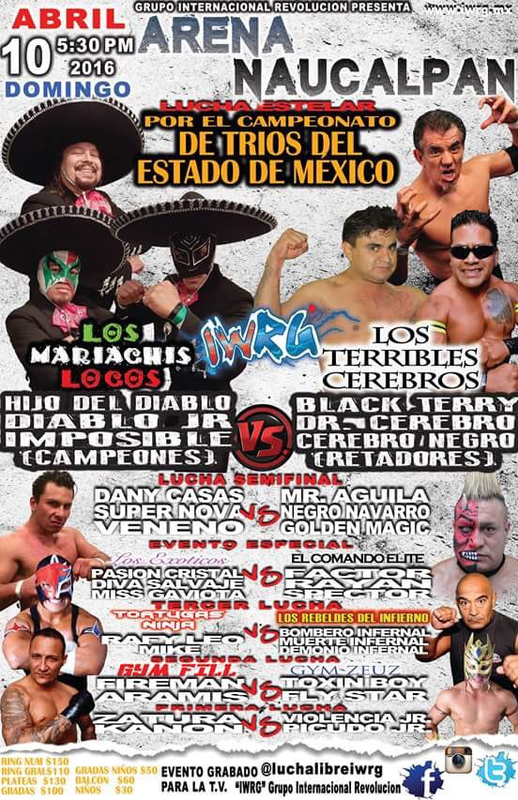 Terrible Cerebros want a tag title match and the Panteras accepted. Turned into a bloody mask ripping match. Traumas took 2/3. Canis Lupus landed badly trying a plancha on Trauma I and appeared to be hurt. 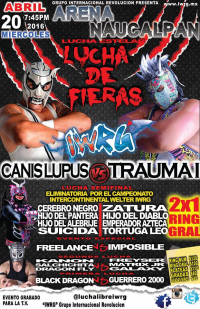 Match ended soon after, and Canis Lupus was said to be doing OK. Third defense. Straight falls. Debut for Tiger. Straight falls. Rematch challenge follows. Halloween replaced Super Nova. Astro lost to Rafy. Black Terry replaced Canis Lupus (injury). Bestia helped Damian escape. 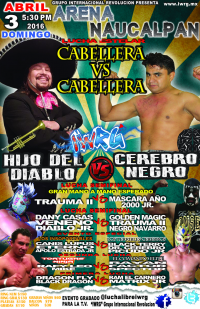 Astro is Emanuel Marin Jacome, 27 years old, 6 years a luchador, from Toluca. Freelance wants a title match. Bloody match. 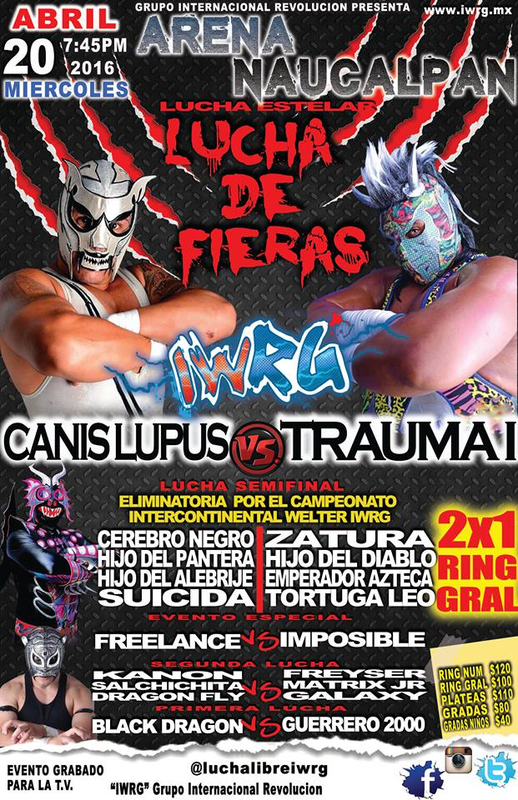 Canis wants a title match against whoever is heavyweight championship after Sunday (Trauma or Mascara 2000 Jr.) Trauma wants a mask match. Very good match. 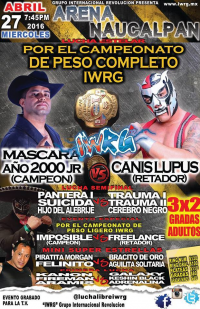 Imposible wins again, making his 12th defense. Freelance wants another shot. first defense. 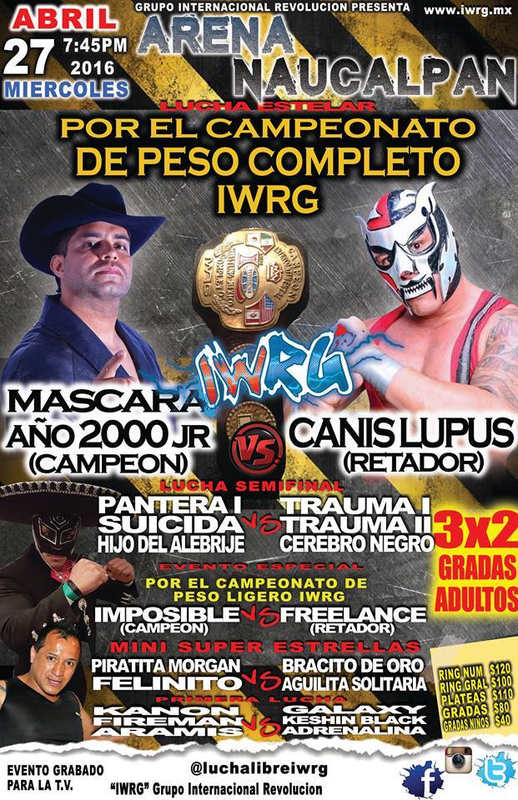 Both men bled, and Mascara used a mask pull on Canis Lupus to win. 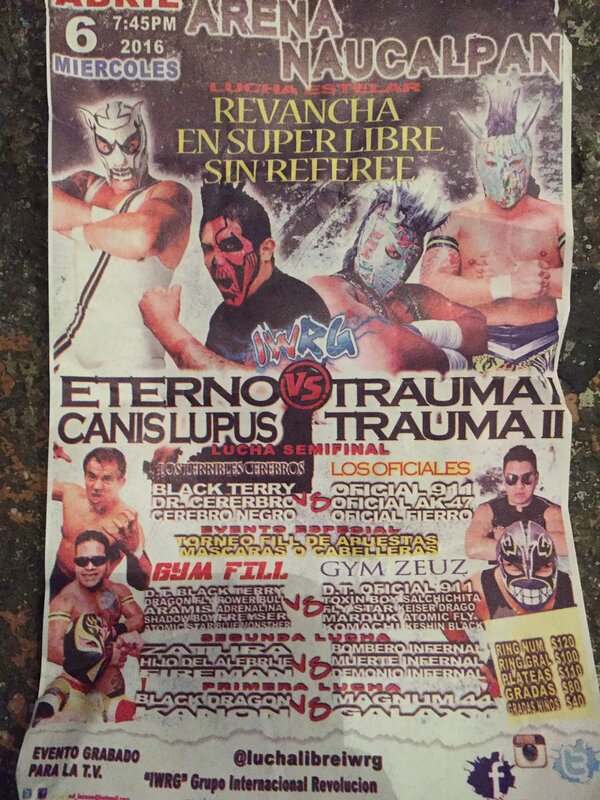 Trauma I showed up to challenge both to an apuesta match.